Smoke and Mirrors: Does Thanksgiving Celebrate the American Holocaust? Does Thanksgiving Celebrate the American Holocaust? At one time, approximately four centuries ago, prior to the Europeans arriving, there were anywhere from 19 to 100 million indigenous peoples populating the western hemisphere. By 1970, there were only 250,000. What happened to those people? They were systematically eliminated over hundreds of years. Yet, we continue to celebrate Thanksgiving, based on the mythological fantasy--created by American expansionists--of America, the "shining city upon a hill," who because of its special virtues, was destined to redeem and remake the west, and now, apparently, the world. 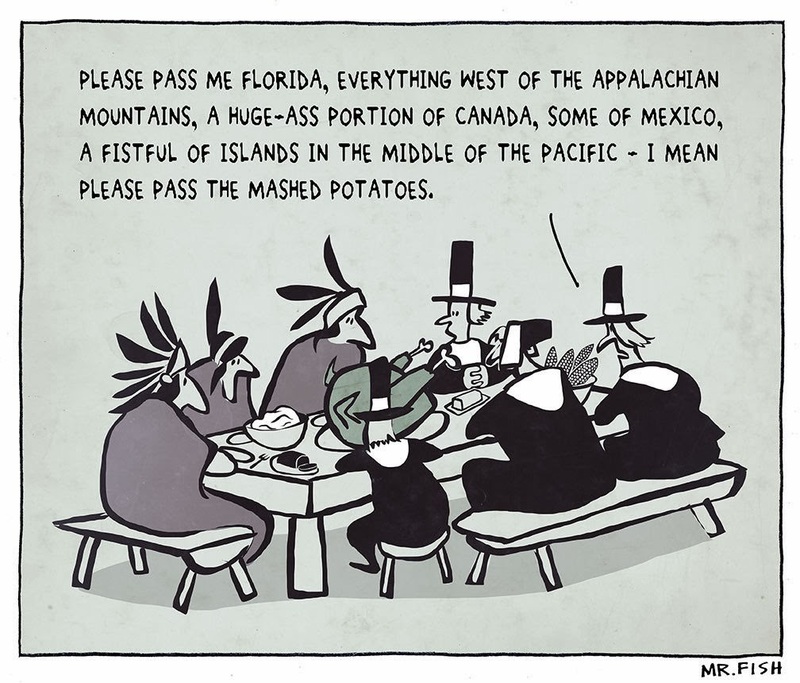 According to former the Chairman of the Anthropology department at University of Connecticut, William B. Newell, Thanksgiving Day is historically based on gratitude for genocide. “William B. Newell, a Penobscot Indian and former chairman of the Anthropology department at the University of Connecticut, says that the first official Thanksgiving Day celebrated the massacre of 700 Indian men, women and children during one of their religious ceremonies. "Thanksgiving Day" was first proclaimed by the Governor of the then Massachusetts Bay Colony in 1637 to commemorate the massacre of 700 men, women and children who were celebrating their annual Green Corn Dance...Thanksgiving Day to the, "in their own house", Newell stated. Even before the concept of Manifest Destiny was put into words, it provided the justification for the largest genocide in history, which raises the question of why we focus so much on the holocaust that took place in Germany during WWII, and not at all on the holocaust that occurred right here, and continues on to the present. Could one of the reasons be that the remaining Native Americans aren't as well funded as the Jewish population? Maybe it's because Hitler applied much of what he learned about the way we dealt with the indigenous people in order to create Nazi Germany, as he did when he studied the plans of Bosque Redondo to design the concentration camps for Jews. After all, Joanelle Romero, who began putting this film (below), narrated by Ed Asner, together in 1995, originally intended it to be 90 minutes, but due to a lack of funding, this 29 minute version, released in 2001, is all that's been completed, and is quite possibly the only film of its kind. “ Hitler's concept of concentration camps as well as the practicality of genocide owed much, so he claimed, to his studies of English and United States history. He admired the camps for Boer prisoners in South Africa and for the Indians in the wild west; and often praised to his inner circle the efficiency of America's extermination—by starvation and uneven combat—of the red savages who could not be tamed by captivity. Don't forget about Columbus. In 1493, when Columbus returned to the Hispaniola, he quickly implemented policies of slavery and mass extermination of the Taino population of the Caribbean. Within 3 years, 5 million were dead. Las Casas is the primary historian of the Columbian era, and he writes of many accounts of the horrors that the Spanish colonists inflicted upon the indigenous population: hanging them en mass, hacking their children into pieces to be used as dog feed, and other cruelties just as horrific as what happened to the Jews in Germany. Of course, Las Casas is omitted from American history books and courses. Expansion of the European colonies after Columbus led to similar genocides. "Indian Removal" policy was put into action to clear the land for white settlers. Methods for the removal included slaughter of villages by the military and also biological warfare. High death rates resulted from forced marches to relocate the Indians. The Removal Act of 1830 set into motion a series of events which led to the "Trail of Tears" in 1838, a forced march of the Cherokees, resulting in the destruction of most of the Cherokee population. Then the discovery of gold in California in 1848 resulted in further American migration and expansion. In California, the Indian population decreased from about a quarter of a million to less than 20,000, because of the cruelty of miners. In addition, one of the most substantial methods was the destruction of flora and fauna which the American Indians used for food and a variety of other purposes, and one of the most ruinous acts was the disappearance of the buffalo because the Indians depended on the buffalo herds. The end result was widescale starvation and the social and cultural disintegration the people. 95% reduction in population. If that's not genocide, I don't know what is. The sad thing is that it still goes on today. According to the film, within the last 40 years, 12,000 Navajo were forced to relocate to contaminated desert lands, downstream from the largest radiation spill in American history. The reason for forced relocation: the discover of the largest coal deposits ever found in North America. John McCain authored the relocation bill, called the 1974 Navajo-Hopi Settlement Act. "More than 100 years later, Navajo people, or Dineh as they call themselves, once again are being removed from their ancestral homelands; their livestock are being seized, they are being harassed by the Bureau of Indian Affairs (BIA) and denied the right to repair their dwellings or build new homes. Why another forced relocation? The Navajo are once again in the way of westward expansion, this time in the form of energy resources development."